Scores of Monarch butterflies (Danaus plexippus) are now migrating toward their overwintering zone in Mexico but they're doing so in dwindling numbers. "Monarch butterflies appear headed for a perhaps unprecedented population crash, according to scientists and monarch watchers who have been keeping tabs on the species in their main summer home in Eastern and Central North America," wrote reporter Daniel Schwartz of CBC News in a Sept. 24 news article. "There had been hope that on their journey north from their overwintering zone in Mexico, the insects' numbers would build through the generations, but there's no indication that happened." 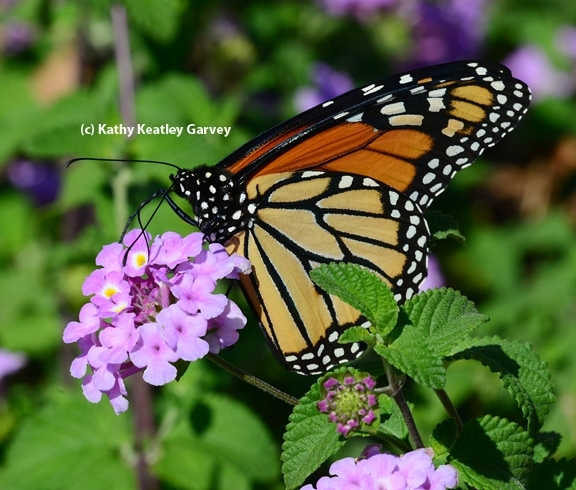 We spotted six Monarchs nectaring on lantana on Sept. 14 in south Vacaville. "I think the numbers are up regionally, but I've seen no breeding at all in the Central Valley," said butterfly expert Art Shapiro, distinguished professor of evolution and ecology at UC Davis. "They bred like mad in Nevada this year." 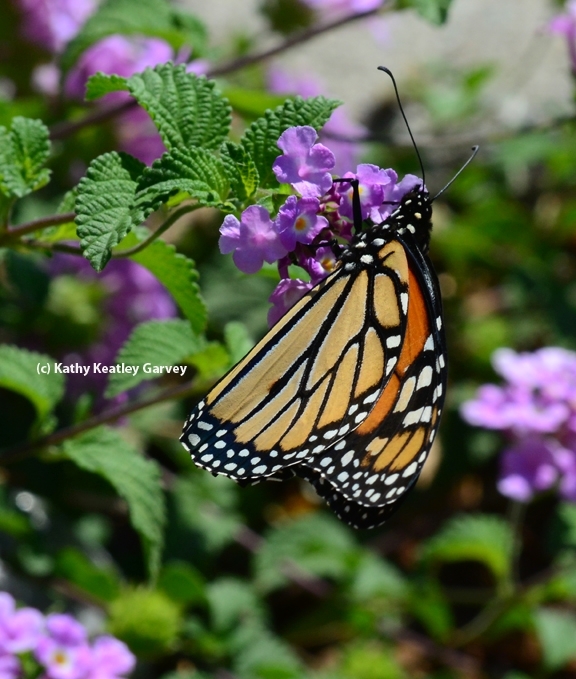 Shapiro writes on his butterfly monitoring website: "The Monarch overwinters on the central coast and moves inland, typically in early March." In his book, The Handy Bug Answer Book, entomologist Gilbert Waldbauer, professor emeritus of the University of Illinois at Urbana-Champaign, points out that Monarchs are the most famous of the "insect migrants that make a return trip." Which begs the question: "Do the overwintering monarchs in Mexico feed?" Responds Waldbauer: "Practically none of them feed. On warm days, they leave the trees to drink water, but the few flowers near the overwintering sites are sucked dry of nectar by the first few monarchs that find them." They survive, he writes, "on large stores of energy-rich body fat that they acquired as they migrated south. On average, their bodies consist of about 50 percent fat. Their fat supply lasts through the winter because, inactive in the cold climate of the high mountains, they use up very little energy." Everyone recognizes the mighty monarch butterfly. But how many people know about its migration? Steve Reppert, chair and professor of the Department of Neurobiology at the University of Massachusetts Medical School, will speak on "Monarch Butterfly Migration: Behavior to Genes" at the Department of Entomology seminar on Wednesday, Feb. 13 from 12:10 to 1 p.m. in Room 1022 of the Life Sciences Addition, corner of Hutchison and Kleiber Hall drives. Hosts are Joanna Chiu, assistant professor of entomology, and Hugh Dingle, emeritus professor of entomology, will host the talk. Dingle, an authority on animal migration, was featured in a National Geographic cover story, "Mysteries of Great Migrations" in November 2010. Reppert received his bachelor's degree from the University of Nebraska, Omaha, in pre-medicine, and his medical degree from the University of Nebraska College of Medicine. He completed a post-doctoral fellowship in neurobiology at the National Institutes of Child Health (NICHD), NIH, in 1979. He is a professor of pediatrics (neuroscience) at Harvard Medical School (2001 to the present) and since 2000, a pediatrician at the Massachusetts General Hospital. Reppert became the chair of the Department of Neurobiology, UMass Medical School in 2001, the same year he became the Higgins Family Professor of Neuroscience at UCMass Medical School. He is a fellow of the American Association for the Advancement of Science. Reppert SM, Gegear RJ, Merlin C (2010). Navigational mechanisms of migrating monarch butterflies. Trends in Neurosciences (TINS) 33:399-406. Heinze S, Reppert SM (2011). Sun compass integration of skylight cues in migratory monarch butterflies. Neuron 69:345-358. Zhan S, Merlin C, Boore JL, Reppert SM. 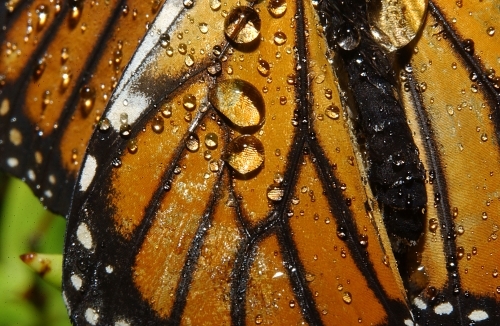 The monarch genome yields insights into long-distance migration. Cell 2011; 147:1171-1185. Reppert's talk will be video-recorded and posted on UCTV at a later date. Sonia Altizer with monarch butterflies. Monarch butterflies, says Sonia Altizer, are "globally distributed and best known for undertaking a spectacular annual migration in parts of North America." However, in wild populations, monarchs are commonly infected "with a specialist protozoan Ophryocystis elektroscirrha; this parasite can be transmitted both vertically and horizontally and causes debilitating infections." 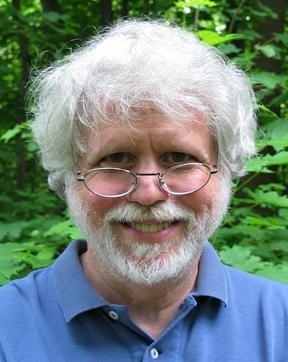 Altizer, an associate professor in the Odum School of Ecology, University of Georgia, Athens, will discuss "Migratory Immunity: Parasite Infection, Host Defense and Fitness Costs in Monarch Butterflies" at the UC Davis Department of Entomology seminar on Wednesday, May 9 in 122 Briggs Hall. It promises to be well-attended, given the avid interest in monarchs and Altizer's expertise. What's so special about monarchs? "Monarch butterflies are known for the incredible mass migration that brings millions of them to California and Mexico each winter," according to an article in National Geographic. "North American monarchs are the only butterflies that make such a massive journey—up to 3,000 miles (4,828 kilometers). The insects must begin this journey each fall ahead of cold weather, which will kill them if they tarry too long." The National Geographic article points out that "Only monarchs born in late summer or early fall make the migration, and they make only one round trip. By the time next year's winter migration begins, several summer generations will have lived and died and it will be last year's migrators' great grandchildren that make the trip. Yet somehow these new generations know the way, and follow the same routes their ancestors took—sometimes even returning to the same tree." Altizer's research focuses on the interplay between animal behavior and the spread and evolution of infectious diseases. 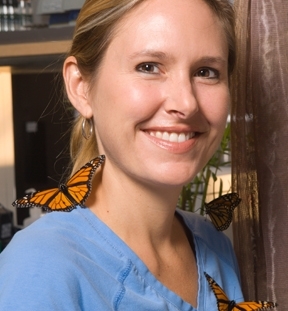 For the past 15 years, she has studied monarch butterfly migration, ecology, and interactions with a protozoan parasite, asking how seasonal migration of these butterflies affects parasite transmission. She also researches a number of other projects, including mammalian infectious diseases and songbird-pathogen dynamics, including studies of house finch conjunctivitis, West Nile virus, and salmonellosis. But we butterfly enthusiasts are happy she's studying the monarchs! Surprise: it's in the antennae! Neurobiologists at the University of Massachusetts Medical School have long wondered how monarch butterflies (Danaus plexippus) can migrate from across eastern North America to a specific grove of fir trees in Mexico. That's 2000 miles, as a crow flies--or as a monarch flies. 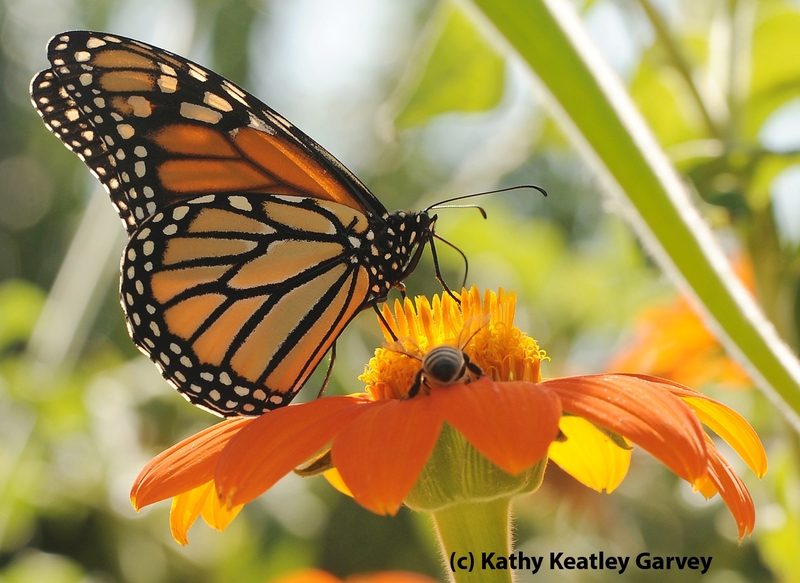 The scientists figured that the key mechanism that steers the monarchs is in the brain. Nope. It's in the antennae. The antennae aren't just "noses" or "odor detectors." "We've known that the insect antenna is a remarkable organ, responsible for sensing not only olfactory cues but wind directions and even sound vibration." said Steven Reppert, professor and chair of neurobiology and senior author of the study, published today (Sept. 25) in the journal Science. "But its role in precise orientation over the course of butterfly migration is an intriguing new discovery, one that may spark a new line of investigation into neural connections between the antennae and the sun compass, and navigation mechanisms in other insects," he said in press release. For those of us who are navigationally challenged and have long admired how insects migrate from Point A to Point B, this is amazing. There are circadian clocks in the antennae. This study makes us look at monarch butterflies in an entirely different light. 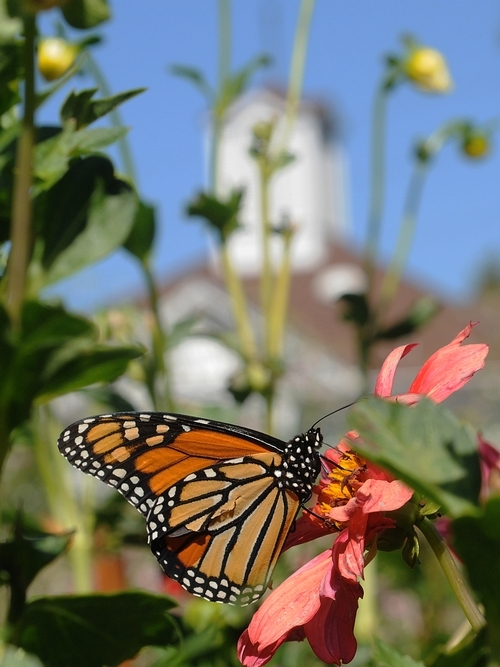 Like the monarchs we spotted nectaring last weekend on the grounds of the Luther Burbank Home and Gardens, Santa Rosa. Their antennal circadian clocks coordinate sun-compass orientation. Or, in other words, those antennae are necessary for sun-related orientation. Folk singer Pete Seeger asked "Where have all the flowers gone?" 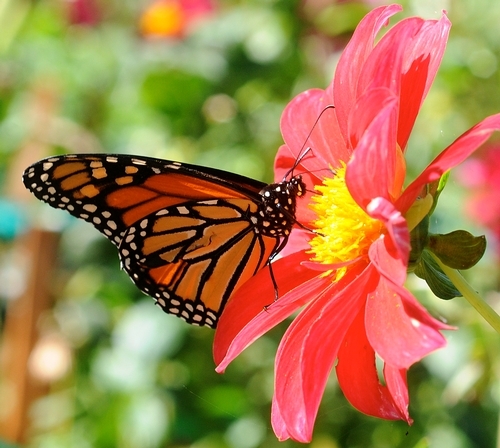 UC Davis butterfly expert Art Shapiro wants to know "Where are all the Monarchs?" 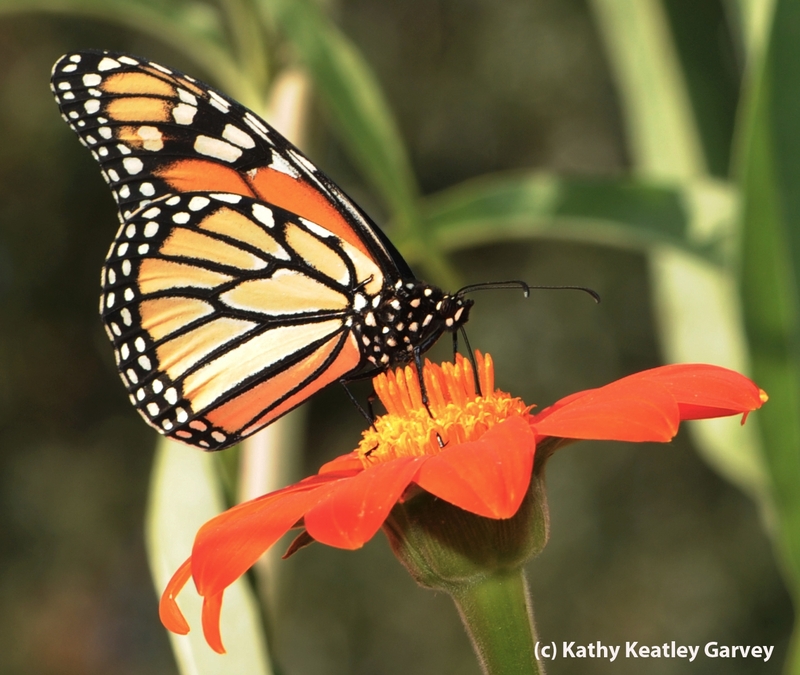 In the current edition of the Bohart Museum Society newsletter, Shapiro notes that California populations of the Monarch butterfly (Danaus plexippus) "are notoriously unstable, fluctuating wildly in numbers." "Because the Monarch is just about everyone's favorite butterfly, certainly the best known, the public is interested in how it is doing," he wrote. "This year it is doing very poorly indeed, at least in the Sacramento Valley." See, Shapiro tracks Monarchs (and other butteflies) throughout much of Northern California. He's been doing that since 1972, using "a combination of fixed study sites visited every two weeks and more casual 'at large' observations." His permanent sites include the Suisun Marsh and Gates Canyon (near Vacaville), both in Solano County; West Sacramento, Yolo County; and North Sacramento and Rancho Cordova, Sacramento County. "Monarchs have been present at all of these sites every year, and bred at most of them nearly every year, until 2008," Shapiro wrote. "As of Sept. 10, no Monarchs in any life stage have been seen at West Sacramento, North Sacramento, Rancho Cordova, or anywhere else in the Davis-Sacramento area. This has never happened before. I've spent just over 60 days at these three field sites this year, and my eyes have been open every day. So this is significant." Personally, I don't see Monarchs, either. 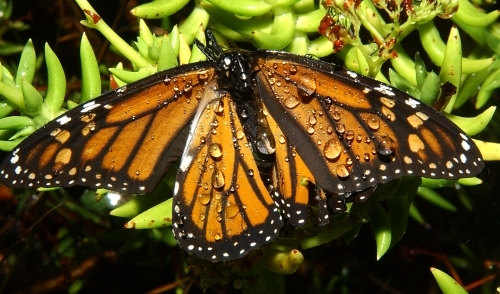 The last Monarch I spotted was along the Mendocino Coast, near Timber Cove, and that was on Oct. 19, 2007. It looked drenched from the rain. I photographed it. The next morning, I looked for it and it was gone.